This annual event features physics department members presenting various experiments testing the laws of physics to the community, all ages welcome. 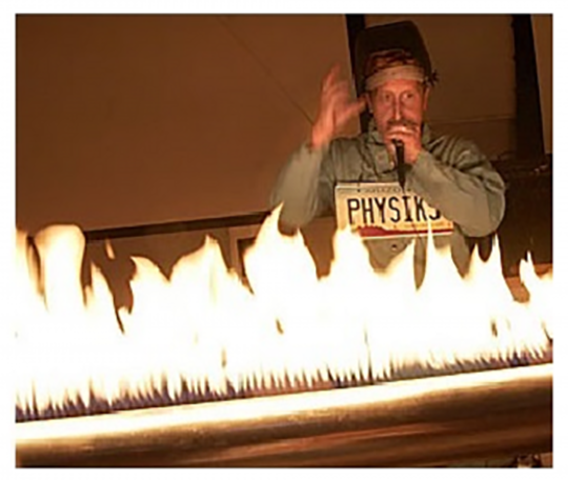 Witness the dancing flames, speaker balloons, the bed of nails, the flying bear, and much more! This event will take place on Friday, November 17th, 2016 at the Physics and Atmospheric Science building (1118 E. Fourth St. Tucson, AZ 85721), Room 201, from 7:00 pm - 8:30 pm. Thank you to Larry Hoffman our Laboratory Coordinator for planning this exciting event, if you have any questions he can be contacted at lhoffman@email.arizona.edu.